The lack of information on secondary smoking exposure and impact to human health is the main problem for Armenian community. 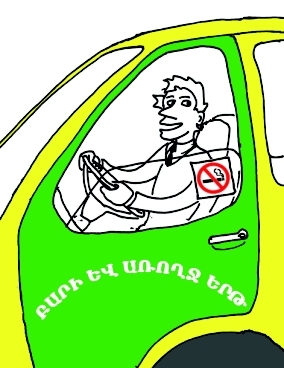 Considering very high percentage of smoking drivers-males in Armenia and traditional acceptance of independent behaviour of man, it is very likely that driver’s smoking in minibuses in Armenia has become a real disaster having a great impact on everybody, especially on children and women of reproductive age. The most exploitable transport in Yerevan is minibus where most of drivers are smoking during work time. Although different programs and policies to reduce ETS exposure in public places and workplaces have been implemented, little attention has been directed to minimizing ETS exposure in public conveyance. The urgency of the ETS problem is explained by the absence of the appropriate law restricted the smoking at working places. The fact that the draft of the Tobacco Law has been failed currently is an evidence of apathy and reluctance of both the citizens and policy makers to change the behaviour mainly due to the lack of information on the problem. 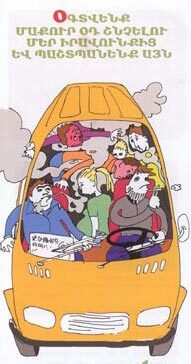 Smoking behaviour of 100 drivers of minibuses from Avan and Avan-Arindg was determined during the project implementation. The risk exposure of ETS in public transport of Avan and Avan-Arindg decreased due to reducing of percentage of smoking drivers inside minibuses on 20% by 2005.